Last week I took my interior decorating students to visit Classic European Antiques which is an antique store here in Edmonton. Some of the students were thrilled to see a display of old Christmas decorations and they began telling stories about who in their lives have or had similar ones. I love vintage Christmas ornaments. 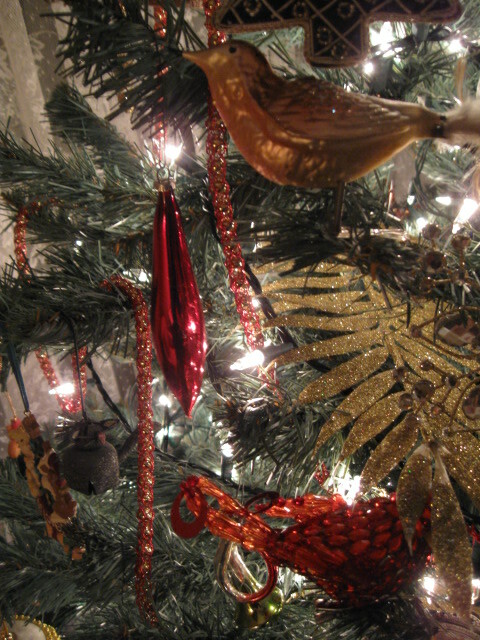 I sold lovely vintage ornaments in my antique store and each year I would add to my personal collection. I love the signs of wear, and I like to imagine the many trees these decorations have graced over the years and how many hands have touched them. 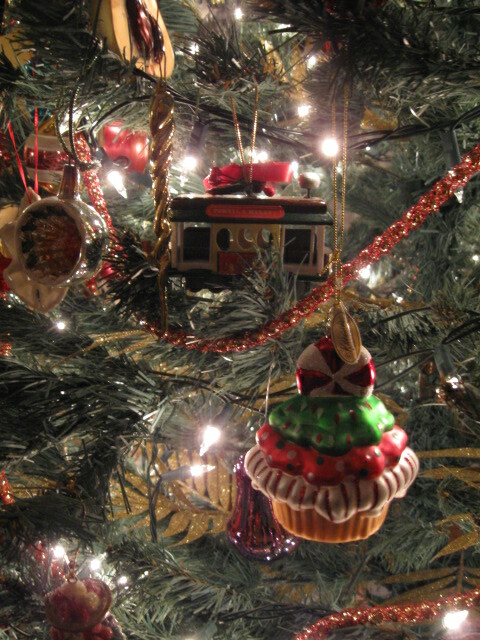 If you’re lucky enough to still have any vintage ornaments, hang on to them. However if you decide to start your own vintage collection be aware that, as with all popular things, there are lots of new copies out there. Earlier ornaments were smaller than today’s modern ornaments. If you have an original decoration bring it along to compare. They were usually done in soft pastel colours with hand-painted details. 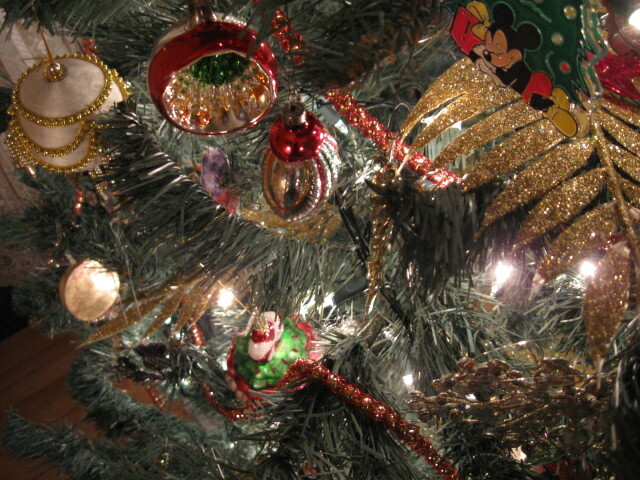 You’ll notice that the paint may be faded or distressed in areas on vintage ornaments. They were hand blown versus machine made. Carefully remove the stem from the base of the ornament and look at the exposed edge of the decoration. Ornaments that are hand blown will have an uneven base because the glass blower could not make a clean break. Modern machine-made ornaments will have a smooth even base. Look at the “tip” on the other end of the decoration. It should have a pontil mark which looks like the hot glass was “twisted”. Look for names of companies or countries of origin on the stem. Collectible ornaments show names like “East Germany”, Japan, USA – but they are marked. Newer, cheaper decorations are not marked. Look at the colour of the metal from which the stem is made. New decorations have stems that look shiny and new whereas older decorations are often discoloured or darker. Ebay, flea markets, church sales and garage sales are all good hunting grounds for vintage ornaments. Collectors that specialize in Christmas collectables are usually very knowledgeable and occasionally sell their excess or duplicate ornaments which is how I got most of my favourite ones. Prices can vary from $2 – $200 depending on the ornament and where you buy it. Before you spend a lot of money on a decoration do research and see which kinds of ornaments command these prices. Familiarize yourself with the shapes that are unique or rare. There were many symbols used in the manufacturing and creation of Christmas glass ornaments. Fruit and vegetable shapes symbolized the harvest. Birds represented the biblical messengers that bring God’s love and peace to the world. Birds were also symbolic of good luck and good fortune. Pickle shapes signified luck. The first person to find the pickle ornament on Christmas morning would be assured of good luck for the entire year. (I have a newer pickle decoration but I still love it) The fish shape is an early Christian symbol for Christ. Star shapes represented the Star of Bethlehem. Reflectors ornaments (ornaments with geometric concave indentations as shown in the middle picture) during Victorian times were often called witches eyes and were placed on the Christmas tree to fend off any evil spirits. Eventually ornaments took on whimsical associations to musical instruments, and other elements of everyday life. Love the article Joanne! I too collect antique ornaments and enjoy their timeless appeal! Storing them safely is always a challenge. Do you have any recommendations for safe storage? Thanks and Merry Christmas! Hi Carol: I store my collection in hard cardboard boxes because the most damaging thing that can happen is to place something on top of delicate decorations thereby crushing them. I roll each one either in a Kleenex or paper towel and place them so that they don’t crowd each other yet they are secure. It’s important that the box (or boxes) are in a location that is dry otherwise the end caps could rust.This way you can protect your collection for years to come.